It’s a good thing I don’t have a day job or I wouldn’t be able to play with compost the entire day yesterday. Well pretty much 9am – 2pm and 5 – 8pm, with a 3 hour trip to the playground in between. But I did get a lot accomplished, so yay!! 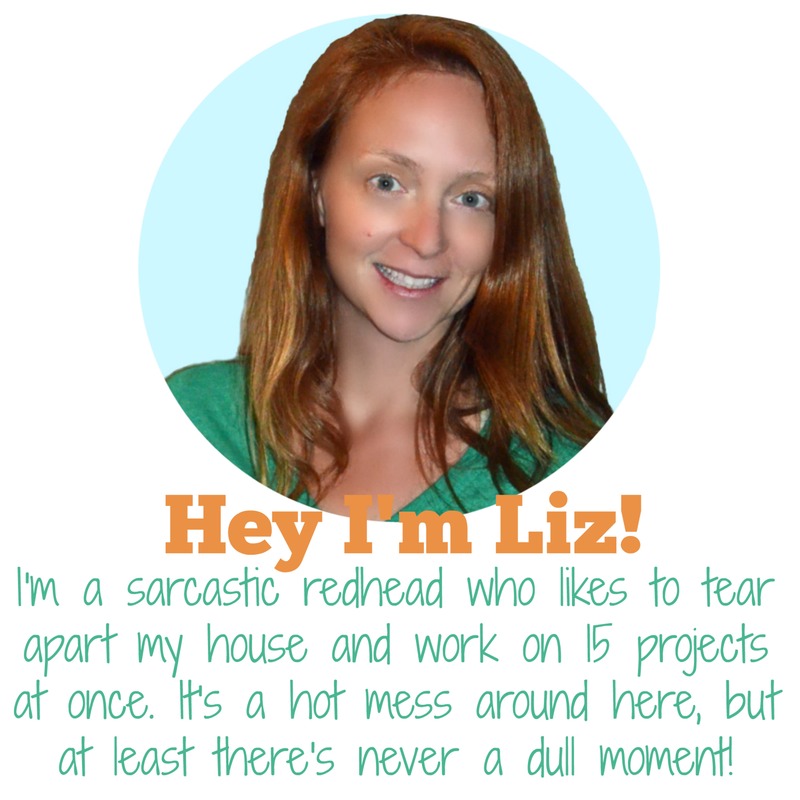 I am unofficially trying to get a million projects finished before our Memorial Day party. I can’t make an actual to do list or I’ll be completely overwhelmed. I told you that I’ve been moving a bunch of shrubs around in my yard recently (post HERE) and I think I got the last of them moved today. 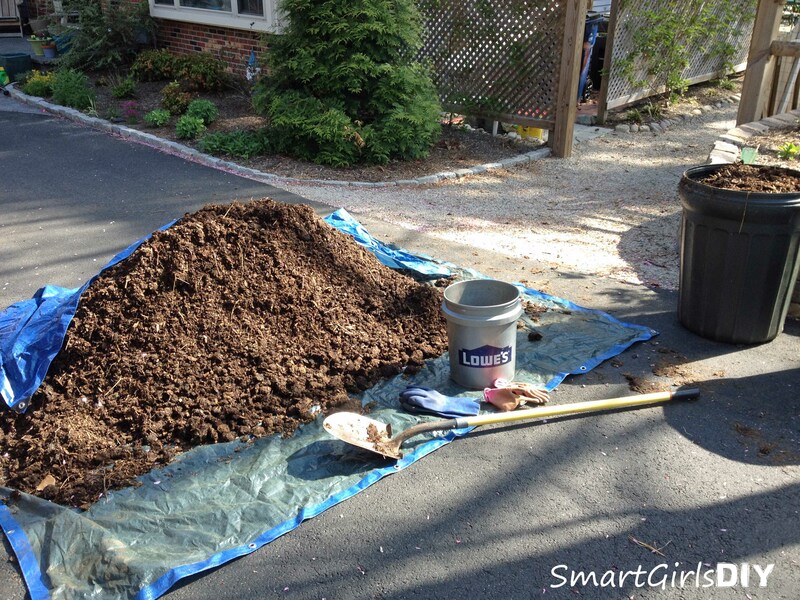 I had been waiting on a truck load of composted horse manure that hubby gets loaded in his truck for $10 from a fellow blogger. 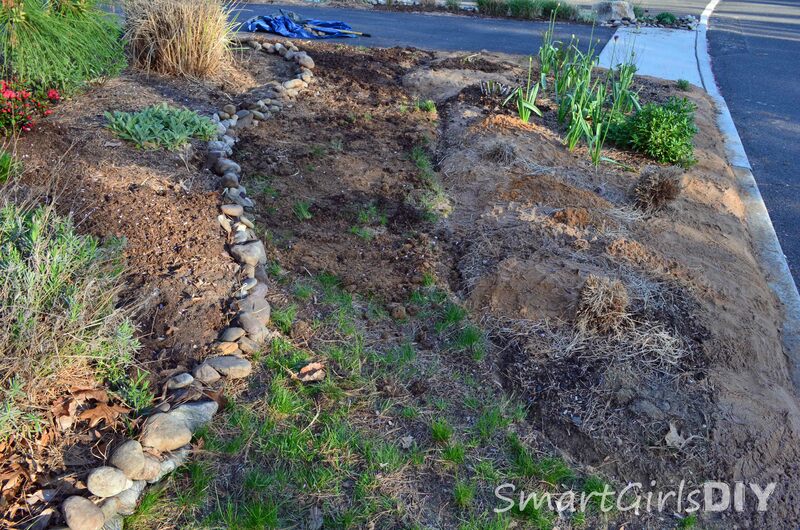 (post HERE) I wish I had the compost last week when I planted my grass seed, but I’ll definitely be using it to over seed the grass in the front yard. This picture shows two beds and there should be grass in between. I love getting a truck load of compost because I can never make enough compost myself, even with a 3 bin system. See all empty. 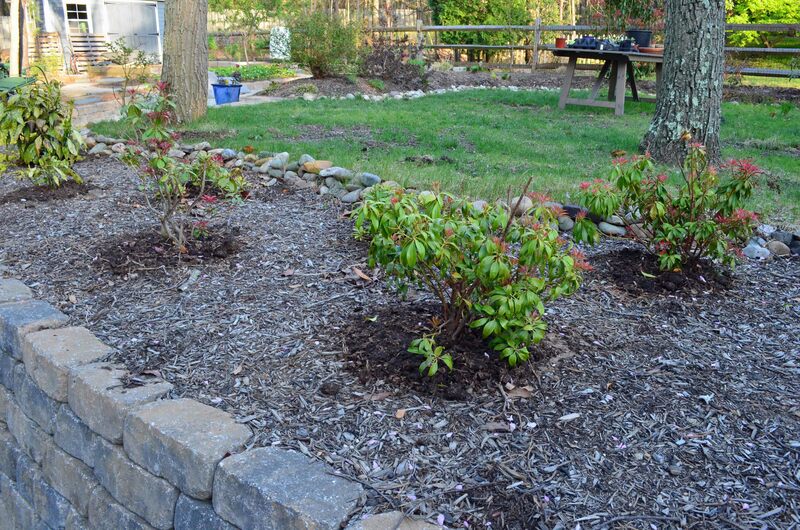 So today I moved a photinia from the wooded area in the backyard up to the front yard, where it will be way happier. The huge photinia next to it was transplanted from a friend’s house last year. (post HERE) The little one looks sad now, but all that compost I added to the hole when I planted it is going to help make it thrive. 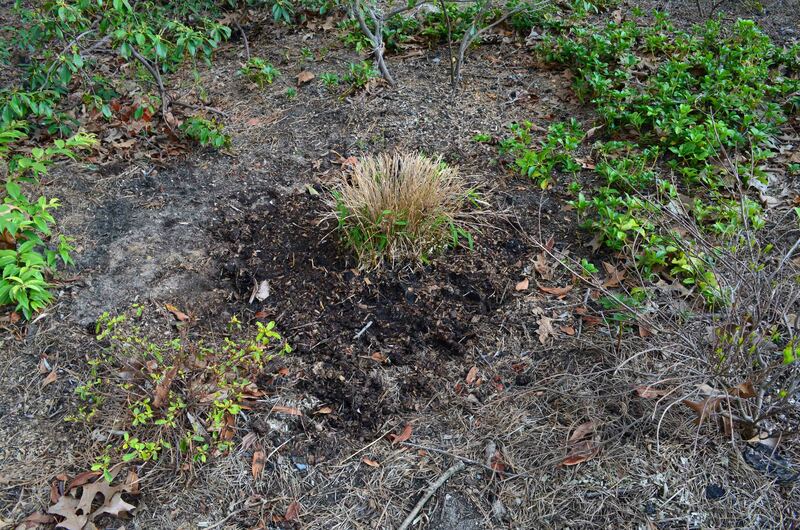 In order to make room for the photinia, I had to dig up a bamboo plant. Don’t even get me started on the bamboo. Biggest mistake of the whole landscape. It’s clumping bamboo, so don’t worry it didn’t run all over the place. In fact, it has hardly grown at all over the past 4 years. Anyway I dug up the bamboo that was in this corner and moved it about 20 feet between two other bamboo plants. It looks so small in this picture, but that sucker was so big and heavy I had to wait for hubby to get home to lift it out of the original hole and get it on the tarp. I hate having to wait for hubby. Check out the plethora of compost around the bamboo. There didn’t just happen to be a gap in the yard to put this bamboo, I had to dig up another, non-thriving, bamboo to make room for this one. I moved the other one out to the wooded area in the backyard. But not to the spot where the photinia was, it was actually the spot hubby dug up the skip laurel last weekend. Never mind. You don’t care. But that bamboo did get a healthy dose of compost too. 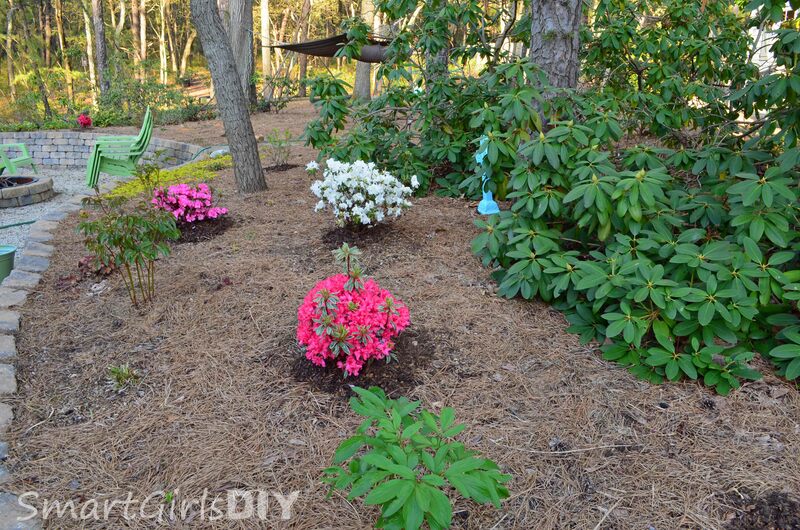 I also added compost to my newly purchased azaleas, and to my established plants. 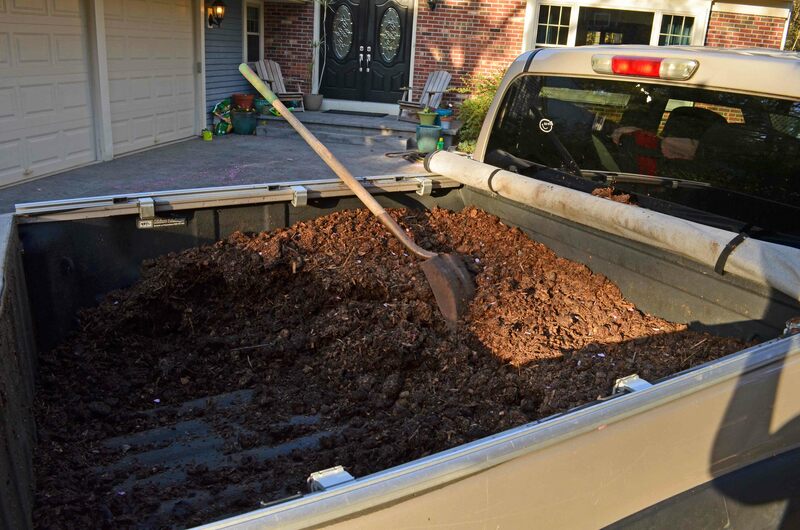 Why buy fertilizer at the store, when you can use some nice composted horse manure!? Haha, I buy that stuff at the store too. 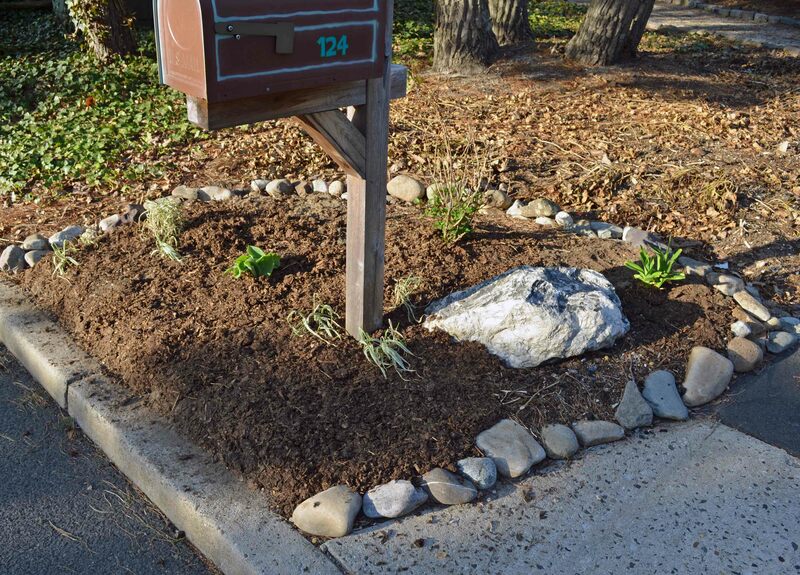 I covered this small front bed in fresh compost. (I know, it still needs a lot of work!) And I made this new bed on the other end of the driveway. 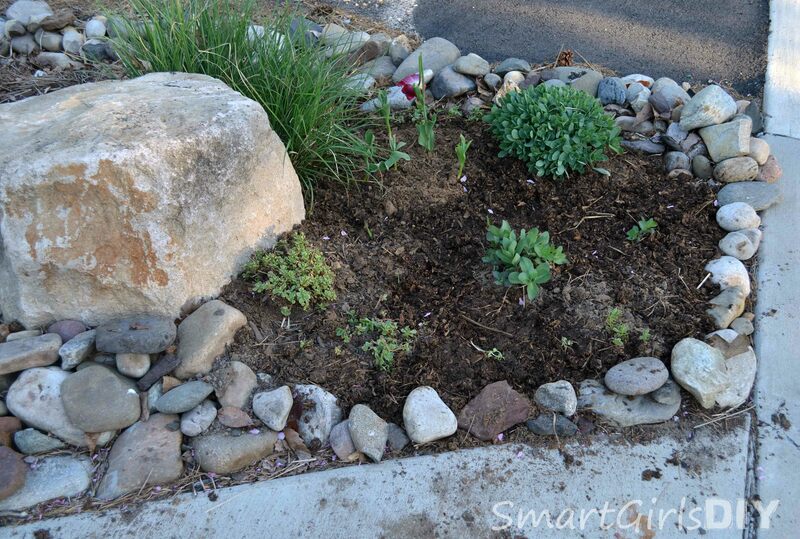 I dug up a ratty looking ornamental grass and added these plants that I dug up from around the yard. 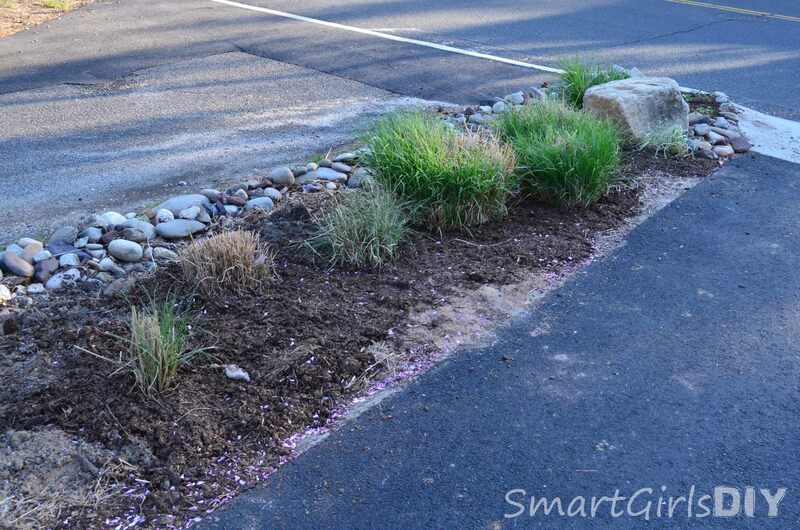 I moved the ornamental grass here, between some other grasses. 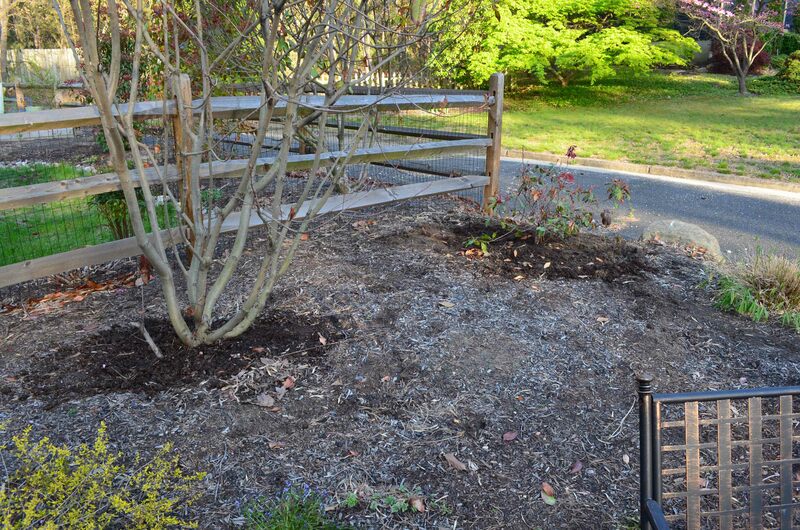 And of course added more compost. 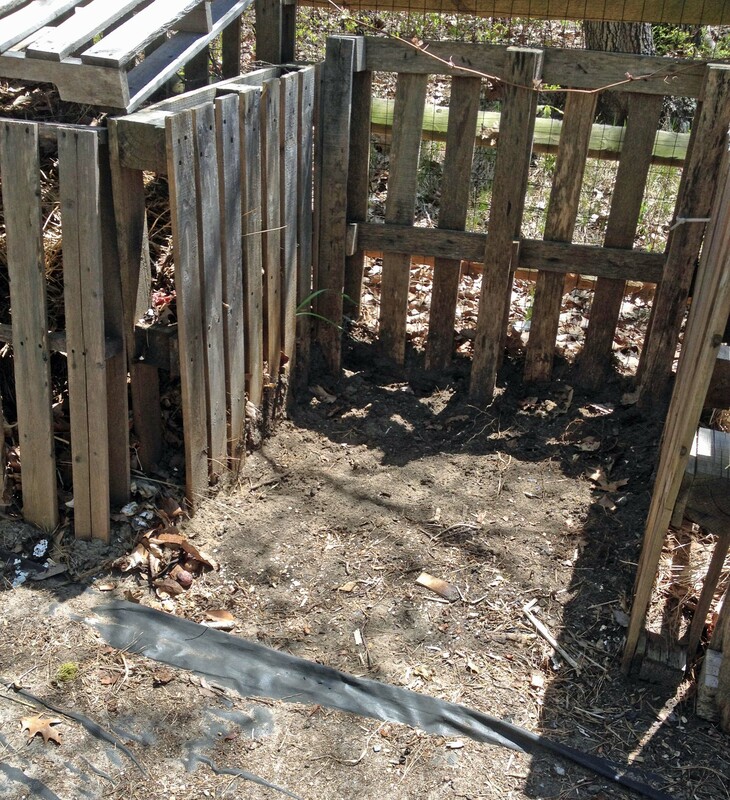 I went through all the compost on the tarp and in both trash cans, and was starting to get sad about my lack of compost, until hubby told me he still had more in the truck. Yay! !